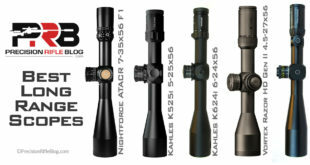 Over the next few posts, I’ll share the top precision rifle products that caught my attention at SHOT Show 2018. It’s impossible to see everything at the show, but these are the items I noticed that I thought my readers might like to know about. 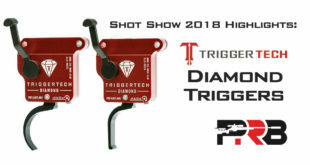 The biggest standout product for me for SHOT Show 2018 was the new TriggerTech Diamond trigger. That is an after-market trigger compatible with Remington 700 clone actions (like those made by Defiance, Surgeon, Impact Precision, Big Horn, American Rifle Company, Stiller, etc.). The new Diamond trigger is adjustable from 4 ounces to 2 pounds, and has zero creep. They’re priced at $290. Previously, TriggerTech only had triggers that were adjustable down to 1 pound, but this new Diamond trigger goes down to just 4 ounces. I’d suspect the majority of competitive shooters in PRS-style matches are running triggers with pull weights set from 8 to 14 ounces. There are a few shooters running down around 3-6 ounces, and I’m sure some may run 1 pound or more. But it seems like most of the top shooters I’ve talked to prefer a trigger in that 8-14 ounce range, and this new TriggerTech Diamond is right in that sweet spot. Honestly, it’s hard to convey the most important part of the trigger … which is how it feels. I wish you guys could experience the break of the TriggerTech Diamond. It was really sweet. But what will probably cut to the chase is the fact that I stopped walking around SHOT and ordered two Diamond triggers online for my match rifles. 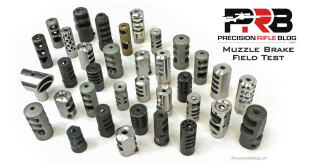 Admittedly, I like to tinker … right now, I own 5 Jewell triggers, 2 Timney’s, 2 Bix ‘n Andy, and an original TriggerTech trigger … but these new TriggerTech Diamonds will be going on both my match rifles as soon as they arrive. 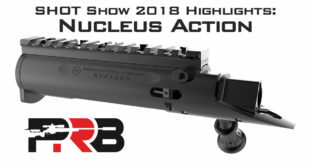 A good friend of mine was with me at the show, and he’s been running Jewell triggers ever since his first precision rifle years ago (I might accuse him of being a “Jewell fan-boy”) … but even he was sold on the new Diamond triggers and ordered a couple while we were at SHOT. Both of us ordered them straight off the website, and paid full retail … which tells you how they felt to us. TriggerTech collaborated with several of the top precision rifle competitors throughout 2017 on this new Diamond trigger. The K&M Team in particular trained and competed with the triggers for the majority of the 2017 PRS season. They, along with other shooters, gave TriggerTech feedback, which resulted in the Diamond trigger that was released in November 2017 … along with a new lever option, which they call the Pro-Curve. Harsh Environment: Our matches aren’t held on a square range in a controlled environment. They are in the field, which puts different demands on a trigger. When the sand blows during a Texas or Oklahoma match, my rifle has ended up so dirty I considered carrying it into the shower with me afterward. I’ve seen multiple triggers go down in a single day of competition, because it’s hard for a high-end, target trigger to perform in that environment. Think about taking a finely-tuned Swiss watch and dragging through sand dunes at 50 mph for a whole day. It’s kind of like that … except we do it again the next day. Zero Tolerance Safety: While on the clock during a stage, we’re required to run to multiple positions with rifle in-hand, and/or fire from improvised/awkward shooting positions. 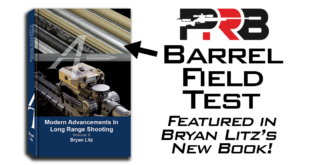 You move with the bolt back, but we might bump the rifle into a barricade or hit it on something as we’re trying to get into position, and an accidental discharge will not only get you immediately disqualified from the match … but you could kill someone. Our rifles aren’t lying on a bench and always pointed straight down range, so bulletproof safety is critical. While there are a lot triggers out there, virtually all of them work on the principle of sliding friction: a trigger lever is used to slide the sear surface away from the hammer to the point where the hammer releases (i.e. the trigger “breaks”). The problem is for the trigger to be safe, there needs to be adequate sear engagement. 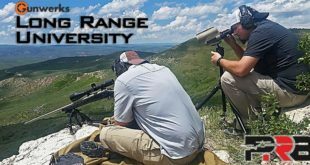 I talked to a world-class benchrest shooter this past week, and he told me the lighter the trigger, the more sear engagement you should have for safety reasons. If you have a light trigger with a minuscule amount of sear engagement, you’re risking an accidental discharge. Funny enough, on my flight back from SHOT Show I read an article on the TriggerTech trigger from the most recent issue of Long Range Magazine. It included this great diagram that helps you visualize how standard sliding friction triggers work, as well as the amount of sear engagement I’m referring to and where you start to encroach on the safety threshold. 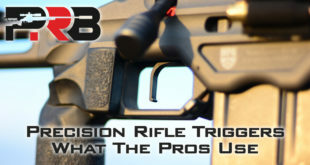 The diagram also shows how the TriggerTech works differently. It features a roller pin between the sear and the trigger, which is a major departure from the traditional sliding friction design. Here is a better picture of the internals of the TriggerTech design, including the free-floating roller. When the lever is pressed, the roller pin and assembly cams over to release the sear with an incredibly crisp break and no perceptible creep. I added the double-ended arrows calling out the area that we’ll refer to as creep, which is any rearward displacement of the trigger that occurs before the sear releases. The blue dots on the chart are where the trigger broke and sear was released. You can see the TriggerTech released after it moved just 0.002-0.003 inches … which is literally the width of a human hair and virtually imperceptible! One of the comparison triggers had 3 times that much creep, and the other moved 7 times that much! Keep in mind we aren’t comparing the TriggerTech to crappy, factory triggers … the article said these were “two leading R700 trigger manufacturers,” both of which are in a class of triggers that can be set to 1 pound of pull force … which only leaves a few options. To compare how triggers perform in harsh environments, like sandy matches in Texas or Oklahoma, tests were performed on five different triggers before and after they were impregnated with a fine Arizona dust (commonly used in clinical trials). Results were recorded using the Dvorak TriggerScan, and the diagram below shows how the pull weight varied on each trigger with dust and without. 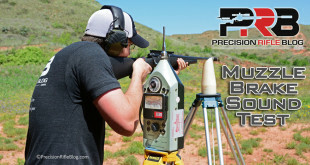 The test above was done using the TriggerTech Primary trigger, which was set to its lowest pull weight of 1.5 pounds. The dust doubled the pull weight of the top two triggers. It caused the next two triggers to fail completely (that would be a bad day). But you can see the dust had very little impact on the TriggerTech. The TriggerTech Diamond for Remington 700 bolt actions started shipping back in November 2017, but there has been such high demand that there is still a 6 week wait time for the triggers (even if you’re the author of PRB 😉 ). 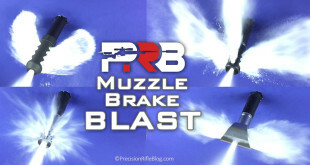 But if you’re looking for an awesome trigger that can perform in the toughest conditions imaginable … hop in line with me! It will be worth the wait. P.S. TriggerTech was also showing the new Diamond version of their AR-15 trigger, which was adjustable down to 1 pound! While going down to a 1 pound trigger may not be a great idea for all AR platforms and applications … the break on it was sick. They said they’re still running some tests and tweaking the design, but they hope to have it out within the next few months. This trigger sear engagement design may be somewhat like the Huber Concepts triggers ? You speaking well of the diamond and voting with your wallet, is an endorsement I value. 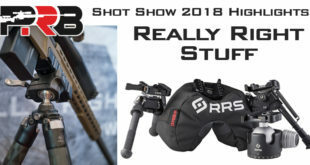 I’m really enjoying your shotshow 2018 posts! Thanks! Honestly, I’m not very familiar with the Huber Concepts trigger. I’ve felt one of their 2 stage triggers, but I prefer a single stage. 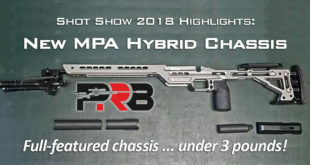 They make a single stage now, but I think it only goes down to 1.5 pounds and I like running lighter than that on my competition rifles. If they’d make this trigger for Savages, I’d buy it!! I’m not happy with mine and have always been a little leery of lighter triggers because of the safety concerns you have mentioned. I’ve never heard of these guys, thanks for posting! You bet. There is a VERY strong after-market community around the Rem 700, which could be the most compelling thing about that platform (or related clone actions). It isn’t an innately better design … but there are a ton of companies always working on ways you could make it better. It’s a pretty powerful thing. I’ve been following your blog for awhile now. I just want to say good freaking job on these posts. Your research and attention to detail is outstanding. 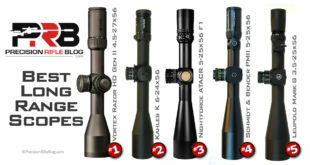 A few years back, I spent hours going over your articles on optics before finally buying a Kahles k24i for my rifle. 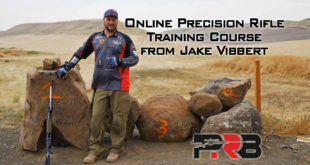 I’ve been consumed with USPSA pistol shooting in 2017 and actually didn’t fire my rifle once, but I still read your blog posts because they’re so damn good. Wow, Kurt … I appreciate that. There is a lot of effort that goes into these, so that means a lot. Thanks for taking the time to tell me you enjoyed them. I am unclear on trigger nomenclature. Are my statements below conceptions or misconceptions? Many thanks for any intel. Whew, Rick. That might be above my pay grade! That sounds right to me, but I’m not sure about the “blade set” triggers. Sorry I couldn’t be more help. I know for sure the Single Stage Trigger is right! 😉 I guess I just never graduated to those other triggers. Fantastic write up – Any idea the break down between trigger shoe? I had the pro curved, but found it a bit wide for my tastes. But it did seem to help with a nice linear rearward pull. I think I am going to try the straight blade – I think it will set up nicely with a vertical mpa grip. But also will have the shelf to center on and uniform ones’ trigger pull from shot to shot. As always Cal: THANK YOU for all your work on this blog. It is my go to website for solid information. Well, I like the flat straight version myself, but my friend really liked the Pro Curve. Neither of us are huge fans of the thin curved blade like what is on the Jewells. Honestly, it all comes down to personal preference. What I like might be different than you, but there isn’t a right or wrong. It sure is helpful to have them all in front of you to try out, but I know not everyone has that opportunity. Unfortunately, it maybe something you just have to try. If you didn’t like the pro curved, I’d suggest trying the flat straight next. Of all the triggers I’ve ever used, I like the feel of it the best. 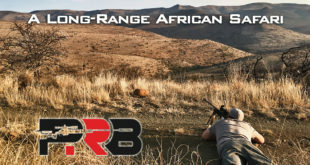 Hey Cal Just getting started with long range shooting and I really enjoy your posts. 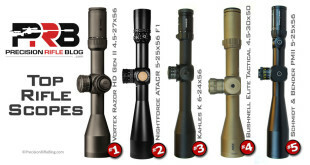 I tried to find info on Long Range Magazine you mentioned but couldn’t find anything. Please point me to the right page. Dang it! I just saw this post and I just ordered a Jewell for a upcoming build. Now I’m starting to think it might go back.